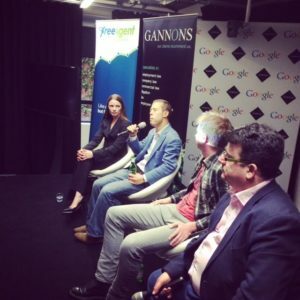 Last week our affiliated meetup group Pivotal Tribes held its latest event at Google Campus in Shoreditch, sponsored by Gannons Solicitors (a commercial law firm focused on entrepreneurs) and FreeAgent (accounting software for small businesses and freelancers). • James Eder, Founder of Student Beans, a lifestyle portal for university students that with over 1 million unique visitors each month is the UK’s top website for 16-24 year olds. • Alex Aldridge, Founder and Editor-in-Chief of Legal Cheek, the UK’s most widely read legal blog. • Julie Falconer, Founder of the A Lady in London luxury travel and lifestyle blog and VisitingEU.com, a network of global travel destination guides that provide practical information and insider tips for independent travelers. • Paul Staines, Founder of the UK’s leading political blog Guido Fawkes, Co-Founder of Wess Digital and Managing Director of MessageSpace, a digital advertising, media-buying and political campaigning agency.